Required (for a dozen blini): 40 grams Caviar (1.43 ounces-for those, not quite so sure about caviar try a smaller amount of caviar, more crème fraiche), 1/2 cup crème fraiche, 1 dozen pre-cooked Blini-Thawed. *Heat blini at 300 degrees for 2 minutes on a non-stick baking sheet. -Top crème fraiche with ½ to 1 teaspoon of caviar. -Feed your loved one by hand while Blini are still warm. ————-Kiss the fingers that fed you. 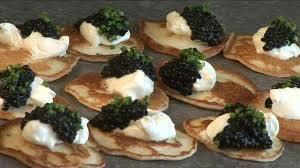 Order caviar, a package of blini and a Cowgirl Creamery crème fraiche directly from Beverly Hills Caviar-easy! Their Classic Ossetra is a great buy, and their Royal Ossetra is a well-priced splurge! As a supplier to leading west coast retailers, they already offer the lowest prices and the best quality I could find (lower than Costco’s Holiday pricing), and this offer makes your pricing even more attractive. Beverly Hills Caviar is extending a 5% discount off their wholesale web-site pricing, to my clients. Use the offer code at checkout after creating your profile for a further 5% off their wholesale pricing. If you think you will be a regular shopper, let me know, and I can request that they create a VIP account for you.